That is what Eric Pickles told this morning's Today programme. ConHome broke this story yesterday. The greatest exposure so far identified is Kent with deposits totalling £50 Million. The next most exposed seems to be the Greater London Authority due to Transport for London having a £40m deposit with Kaupthing Singer & Friedlander, which has been placed into administration. North Lincolnshire Council £2m invested with Landsbanki and £3.5m in Heritable. North East Lincolnshire Council said it had £2.5m with Landsbanki. 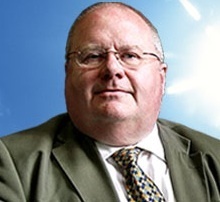 Eric Pickles has issued this statement: "The Government is continuing to dither in face of a worsening problem. Hour by hour, it is clear that more and more councils have been exposed to the meltdown in Iceland's banks. Councils have literally billions on deposit. If they now all panic, pull their money out in the safest option like Government bonds, there will be adverse consequences. The withdrawal of a huge amount of the money from the banking system will destabilise it further and harm liquidity. A lower rate of return from investments will also increase pressure on council tax bills in April. Councils' investment strategies directly stem from guidance issued by John Prescott in 2004. Alistair Darling needs to rewrite this advice immediately and provide reassurance to the public that they won't see their council tax bills rise or local services cut as a result of this crisis."